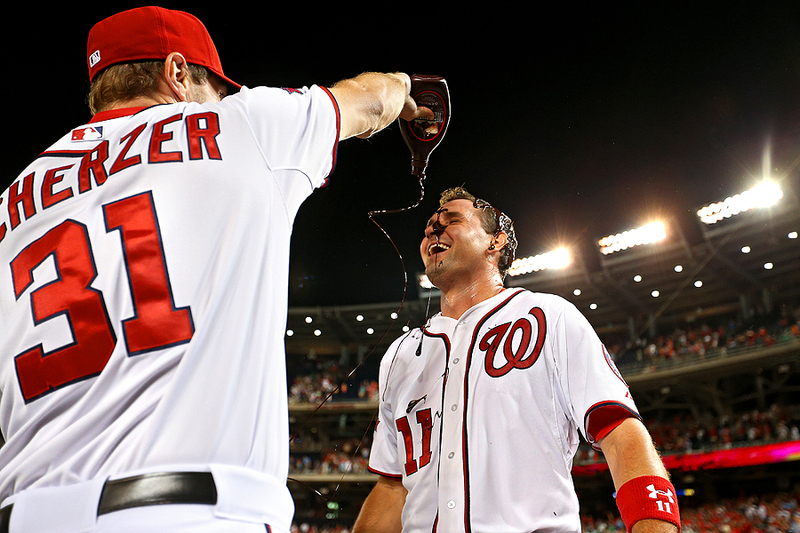 "Ryan Zimmerman #11 of the Washington Nationals has chocolate sauce dumped on him by teammate Max Scherzer #31 after hitting a two run walk-off home run in the tenth inning against the New York Yankees at Nationals Park on May 19, 2015 in Washington, DC." Walk-offs are so sweet in baseball - and even sweeter when you're a Washington National. Let's face it, there is nothing better than celebrating a big win or heroic comeback. Whether it's pre or, post season, and even somewhere in the middle, it feels great to celebrate. The classic way to do such a thing, is with a Gatorade bath. Always a popular staple in the world of sports. However, said sports drink has seemed to gone missing in Washington, DC. Now following any big performance, in this case, a walk-off home run to win the game, the new treat is chocolate sauce. All that is missing is a cherry on top. It's a new twist to an old moment and I don't think anyone is complaining about it.